Distinguish yourself from your peers through the AICP Candidate Pilot Program. Demonstrate to potential employers a commitment to mastering planning skills and maintaining the highest standard of ethical practice. 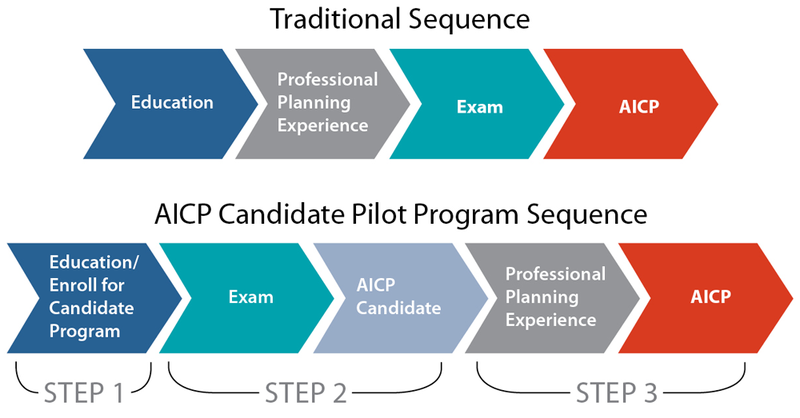 The AICP Candidate Pilot Program provides you with a path to start earlier — the criteria to become AICP are the same. Beginning to track Certification Maintenance credits — 16 CM credits must be completed and tracked before applying for certification. APA will verify program enrollment for graduate participants no later than four weeks after an enrollee completes these steps. Accepted enrollees are encouraged to review these exam prep tips. They also may begin earning Certification Maintenance credits and select mentors. IMPORTANT: Although eligible members may enroll in the AICP Candidate Pilot Program at any time, since graduation is required to register for the exam, when you enroll may affect when you can take the AICP Certification Exam. Members who join the program as graduates must enroll by a deadline set for each exam cycle. Specific dates are posted below. 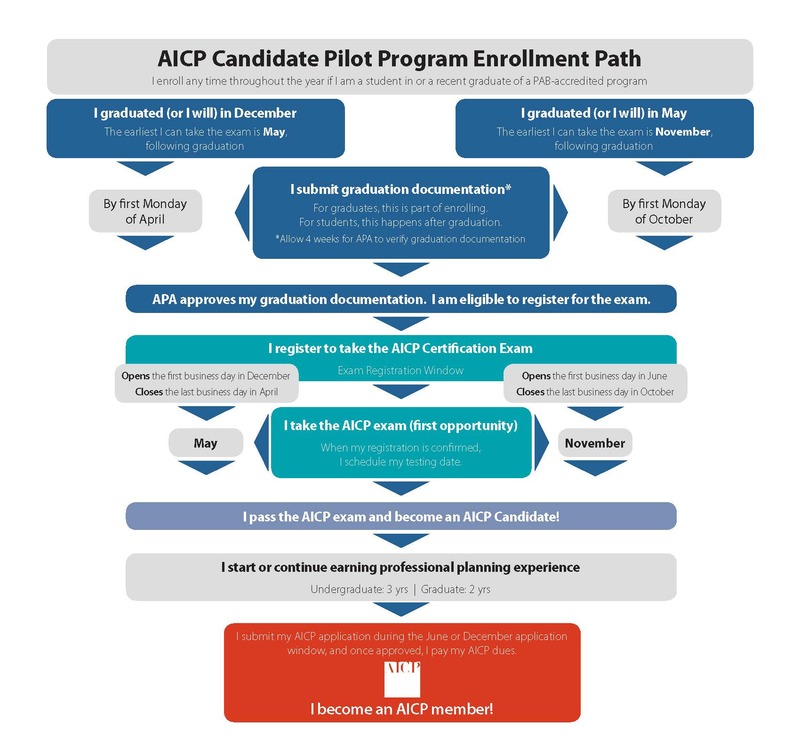 Requirements for Step Two depend on whether the AICP Candidate Pilot Program participant was a student or a graduate at the time he or she enrolled in the program. Program participants must graduate to register for the exam. It could take APA up to four weeks to examine graduation verification documents. Participants should refer to the specific deadlines shown below. Review additional details about registering for the exam in the AICP Guide Part 2: Taking the Exam. Who Is Eligible to Participate in the Pilot? Students and graduates of PAB-accredited programs may enroll in the program. AICP Candidate Pilot Program participants have five years to earn the AICP credential. That period begins when the participant enrolls in the program (Step 1) and ends when their essays are approved, they pay AICP dues, and they join AICP (Step 3). Five years allow sufficient time for participants who begin as students in undergraduate-level PAB programs to complete the program. Qualified members may enroll in the program at any time during the year. For complete details, including enrolling in the program, signing up for a mentor, and registering for and taking the AICP Certification Exam, download the AICP Candidate Pilot Program Guide. If you have additional questions, contact us using our customer service form.